According to a new market report pertaining to the ultrasonic air in line sensor market, published by Transparency Market Research, the global ultrasonic air in line sensor market is expected to reach US$ 106.7 Mn by 2026, expanding at a CAGR of 5.8% from 2018 to 2026. North America is expected to lead consistently during the forecast period, with the market in the region expanding at a CAGR of 6.0% through 2026. Factors such as air content, pressure, and flow rate need to be continuously monitored in lines leading into or out of the patient’s body. Ultrasonic air in line (AIL) sensors provides non-invasive detection of air bubbles and flow rate measurements of fluids. Furthermore, they are unaffected by optical, dielectric, or physical properties of the tubing or fluid unlike optical and capacitive air in line sensors. Thus, superior features of ultrasonic air in line sensors over other air bubble sensors is an important factor anticipated to facilitate the market growth throughout the forecast period. The global ultrasonic air in line sensor market is broadly segmented by sensor type, application, and end-user. By sensor type, standalone chip-level integration held the highest market share in 2017 and is further expected to maintain its dominance throughout the forecast period. In standalone chip-level integration, the detection circuitry is integrated in the sensor itself. It is used where space is limited due to its compact design and integrated electronics. Increasing developments in patient portable devices is the prime factor responsible for the high share of standalone chip-level integration sensor type. Large global volume of neonatal, anesthesia, and epidural devices that administer intravenous medications and solutions utilize air in line sensors. Therefore, pumps for medical technology accounted for the largest market share in terms of application. Based on end-user, hospitals and home care settings are collectively expected to comprise approximately 83% of the global ultrasonic air in line sensor market by 2026, in terms of revenue. North America dominated the ultrasonic air in line sensor market in 2017 with the U.S. contributing majority share of revenue. The dominance of the region is attributed to focused research and development activities and presence of large number of sensor manufacturers. Europe and Asia Pacific collectively represented ~48% revenue share in 2017 with France and China representing largest revenue share in the respective regions. Amongst all regions, the market in Europe is expected to expand at the highest CAGR of 6.2% and 6.8% by revenue and volume respectively during the forecast period. The research study includes profiles of leading companies operating in the global ultrasonic air in line sensor market. Market players have been profiled in terms of attributes such as company overview, financial overview, business strategies, and recent developments. 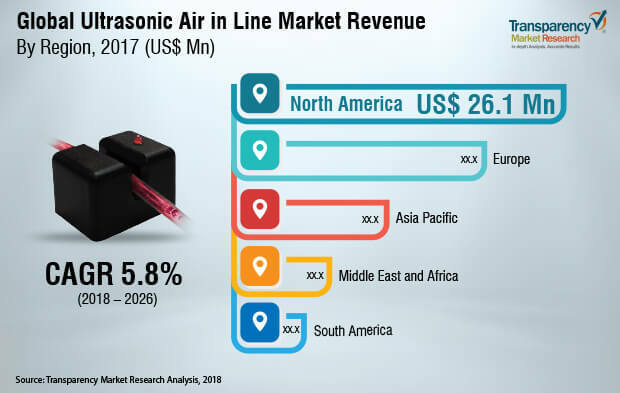 Key players in the ultrasonic air in line sensor market includes Biosonix Ltd, Sensaras LLC, TE Connectivity Ltd, SONOTEC Ultraschallsensorik Halle GmbH, Siansonic Technology Co., Ltd., ClearLine MD, Piezo Technologies, Moog, Inc., Introtek International, L.P., CeramTec GmbH, and Strain Measurement Devices, Inc.